Day Camp Spring Lake riding program is progressively structured to provide campers with a fun experience. Camp Spring Lake is excited to partner with YMCA Camp St. Croix for our Horse Camp program. Camp St. Croix prides itself on well-trained horses, nicely groomed trails, beautiful scenery and knowledgeable staff that will do their utmost to make your ride an experience to remember. Instruction is provided at the staging area and on the horses. Safety is our top priority at Horse Camp. For our horse program, we recommend that participants wear leather shoes or boots with a 1” heel. Long pants and protective helmets are required of all participants. Helmets will be provided by the camp. Our Horse Camp is a progressive recreational riding program and is not intended to replace formal riding lessons. 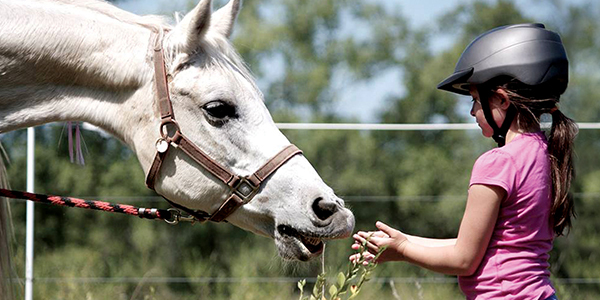 Colts is a two-hour-per-day introductory program for campers with little or no experience around horses. First-time riders will build confidence and skills while learning the basics of western horseback riding. Instruction includes safety, leading, mounting, dismounting, reining, and basic trail riding. The remainder of the day is spent in traditional camp activities at Spring Lake. 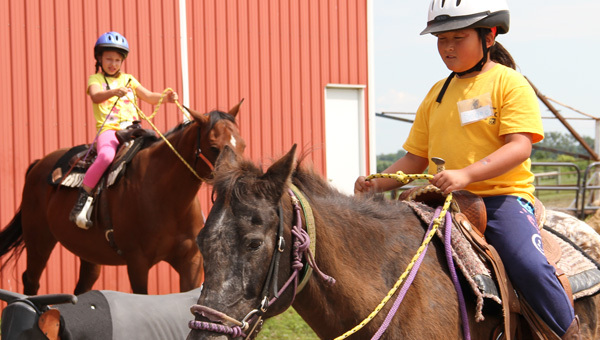 Buckaroos is an intermediate program for campers with at least one year of riding experience. Two hours of daily instruction includes a basic skill review, intermediate ring riding, trotting, grooming and saddling. The remainder of the day is spent in traditional camp activities at Spring Lake.